I think that's a little unfair if you ask me. Windowblinds is working better than it ever has I would say--I had versions 4 & 5 back on XP--and I have very little incompatibility with apps these days so far. 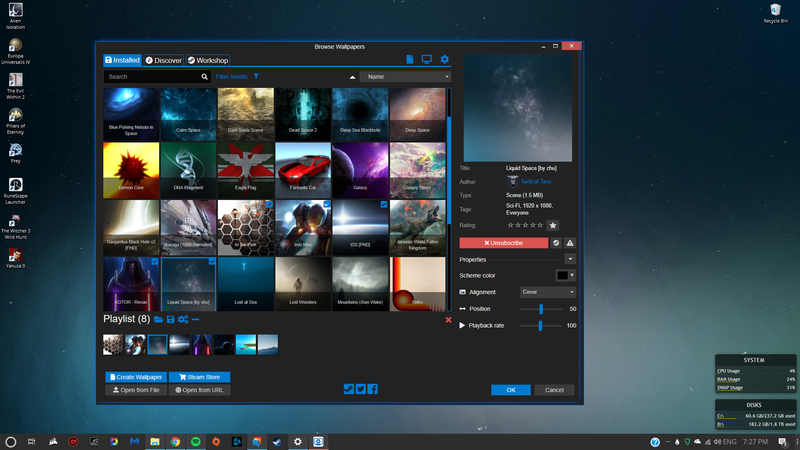 As the flagship app for Stardock I think it's a very good piece of software, as it should be. The problem I mentioned earlier with the recent large Windows 10 update I resolved by simply reloading the Style and Mozilla's software must just be coded in a particular way that is difficult to work around but again, with only a little tweaking even those work too. I was unaware of Fortnite but the problem mentioned makes sense. Code has been injected into the process (which is also how cheat engines work) so Windowblinds can draw a different window border for it but seeing as it's a video game, it runs full-screen anyway. The additional stuff is just being detected falsely as malicious. Isn't the problem fixed if Fortnite's executable is added the ignore list? Lol. Unfair? I literally have to disable it from every major piece of software I run on my rig. How is it unfair to find that poor? I tried a couple of the apps you mentioned and Chrome runs fine but yes, the title bar doesn't skin properly. It's still completely functional though. I had no trouble with Nox either but you won't see WindowBlinds even touching that one. Is that really a big deal though? I haven't tried any others as my computer is quite old so I know for sure that OBS won't run well for me for example. I have the same problem with Steam but it runs fine. And while restoring the window size messes things up, I can drag the window out so I can't see the funny edges any more. I think I just must be more forgiving as I don't have apps crash (except Paint.NET so far) with WB these days, which did used to happen more often back in the day. I love the look of my computer running Stardock software and I think things I used to run years ago still compliment Windows 10 nicely nowadays. Ah, good to know. Thanks Dave! Tried to do a "separate skin" for just Chrome (and force it to take the skin), but it just doesn't work (regular windows look). For Chrome, look back two messages ago... You missed that didn't you! Yep ... missed it ... and it works with Chrome now. Thx! My reply seems to have disappeared. Toolbar drop down menus are non-responsive in Brackets (Adobe software). Windows 7 x68. All software up to date. 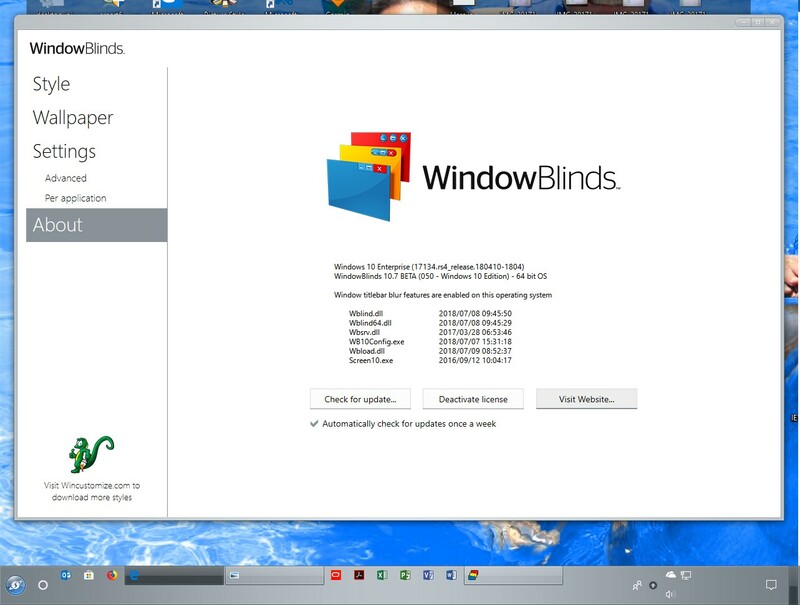 Original WindowsBlinds theme. Another one- I've noticed that in Edge, the website preview show/hide button isn't showing at all for some reason and it's impossible to add Edge to the exclude list as far as I can make out (due the way it runs). You can still switch full previews on and off with a registry change although I won't be posting any links to where you can find them as I'll probably be told off for doing so! They're not hard to find. I'm reverting to previous version because my start bar buttons are blanked out with this BETA build. Is there a whitelist where you can add manually the way oh exe ? The uninstaller also affects Start 10 until reboot ! Can you start a new thread for your issues, please. I am COMPLETELY FEDUP. Star Dock stated that Visual Studio had a fix several months ago. I have been very patient. It still crashes on it and I have to go through the whole process of shutting blinds down. Why on earth is this issue not resolved now and an update released? I agree, the updating of a severely buggy product being announced and never happening is unacceptable especially from Stardock who's reputation is built on these products. I have uninstalled WB, and will not be renewing my OD license ever again. If there were any sort of team or priority associated to this it would have been resolved ten times over by now. Black ops 4 crashes on the start up cut scene most of the time, or as i'm loading into a game while i have windowblinds on. Adding blackops4.exe to the exclusion list doesn't fix the issue either, only disabling windowblinds prevents the crashes. This happens on WB 10.73 BETA too. Oh that's cute that you guys think that they care. After 6 months I kind of accepted that they weren't fixing the product. VC is working fine for me with the latest beta. Thanks. I am now having issues with a Windows 10 App Store app called JW Library. I can't work out where the path is to exclude it from being skinned. Here's what you need but be prepared for frustration. You have to take ownership of the folder and each time there's an update a new folder for the app will be created so you'll need to add the app again. Thankfully I haven't encountered a Metro / WSA app that I've had a problem with with WB, yet... I was tempted to exclude Edge and stuff myself but what a bother and I can live with how they're currently handled. I appreciate how WB can often decide to just leave an app entirely alone rather than attempting something and it going wrong. I did forget to point out that for some reason WindowFX doesn't like it when I drag Edge around my desktop, but it's not the end of the world. In other news, Thunderbird (version 60) has gone full Metro / WSA (as in look not in install location) and so is now completely incompatible with Windowblinds. It does keep the colour-scheme when it's ignored in settings though but that's normal Windows behaviour I think?